Application Quality Testing: Are Defects Bugging Your Organization? As organizations continue to develop software at rapid speed, it has become increasingly important to monitor quality through the use of reliable insight into the output of development processes. The information gained from this type of assessment makes it possible to meet an increasing demand for IT cost accountability and reduces the impact of bad code. Does your development team spend excessive time performing maintenance due to poor application quality? Are these efforts consuming your IT budget or resulting in delayed deliverables? Are you aware these are symptoms of a greater problem? Application quality is a top concern among organizations because the results of bad code are not only costly, but detrimental to business operations – making money and keeping customers happy. A system outage reduces sales, angers customers, and harms the reputation of a company. Undetected vulnerabilities within critical systems jeopardize compliance and may be a direct result of bad code practices. If your organization is not implementing the right application quality management methods to monitor these items throughout development, then critical problems are silently waiting to cause significant issues for your business. What Application Quality Characteristics Are Important? Changeability - How easily systems can be changed to add new features. Robustness - How resilient systems are. Performance - How well systems operate in production environments. Security - How secure systems are against cyber threats. Applications must be easy to change in order to accomplish quick modifications and decrease the amount of required effort. If a program does not have changeability as a characteristic, then the odds of something else breaking during modification are extremely high. Robust, high performance software offers increased availability, decreased cost of ownership, improved scalability, and enhanced security. Automated analysis solutions can be used to accomplish early defect identification at the source-code level and alleviate problems caused by vulnerabilities between application layers in complex infrastructures. The information gained from this type of assessment helps organizations ensure these characteristics are present within developed software. Every characteristic discussed above can be quantified using a defined series of metrics and analysis methods. Source code analysis allows organizations to precisely locate sections within a program that require improvement to ensure promotion of application quality. 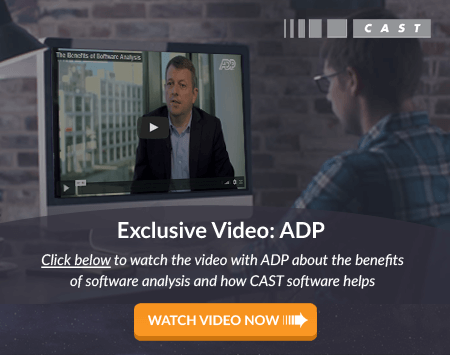 CAST Application Intelligence Platform (AIP) is the only enterprise-level software analysis solution with the capability to assess these characteristics for multiple languages within complex, multi-tier infrastructures. AIP is a beneficial solution for continuous assessment during every portion of the development life cycle. It helps organizations determine if money should be invested in a program or if the program should be retired. AIP functions as a management tool for development planning, estimation, and scheduling. Additionally, it offers great insight regarding performance, complexity, and risk for agile, rapid development environments. Click here to learn how AIP will help you effectively boost you application quality testing investment.